Long-time readers will know that I’m a big fan of skiing. It’s a sport that makes me feel simultaneously at one with nature and myself. It forces me to push myself and make myself better. You’ll also remember that I’m all about scoring a great deal when I go skiing, because it can be an expensive hobby. Last Spring I had the opportunity to go up to Alberta. As in Alberta home of Banff. Alberta home of the Canadian Rockies. Alberta home of the Big 3. 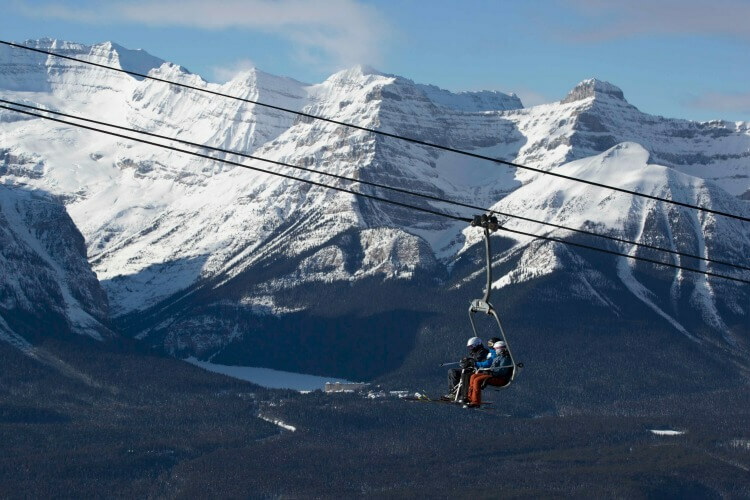 While I was there, I was fortunate enough to visit one of the Big 3: Lake Louise Ski Resort. While I was super psyched to ski the Rockies, as any Eastern skiier would be, I was even more psyched at how much value the resort offered. 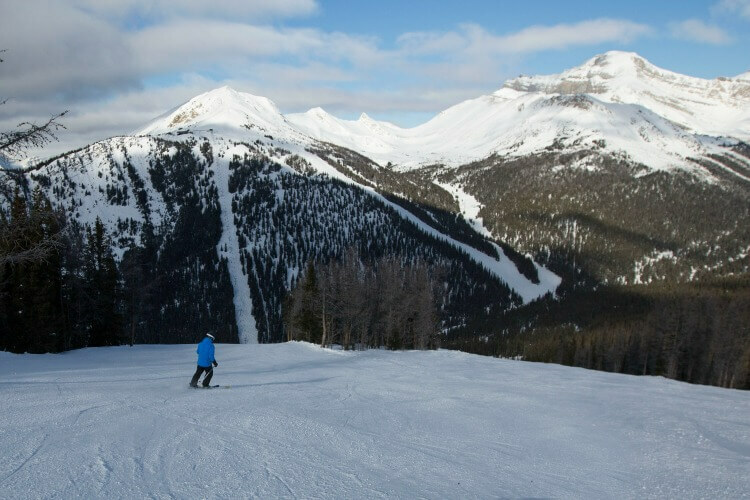 Lake Louise has 145 marked runs plus back bowls that cover three mountain faces. For a comparison, the biggest local ski resort around here has 33 runs. That’s more than 100 less. Yet if I wanted to go skiing after a week of hard work, an all-day pass at Lake Louise costs $99CAD, and an all-day pass here at home costs $85USD. You might be thinking that my home resort costs less money when you look at those numbers, but that leaves out a very important part of the equation: the exchange rate. As of this moment, $99CAD is equivalent to $74.14USD, making this an even better deal for American skiiers. That’s right. On any given weekend, the resort in the Rockies with 145 trails is less expensive to ski than the course in the Appalachians with only 33. It’s insanity. In such a good way. PRO TIP: Lake Louise is inside a national park. You will need a national park pass to get in. However, because it’s Canada’s 150 birthday, you can get them for free in 2017. Just make sure you have it before the drive up. When we went up, my husband took a ski lesson as he had never been before. He struggled, to be sure, as most of us do on our first attempt. But he said the biggest motivator was the fact that he wanted to succeed for his instructor–who just happened to be extremely patient and one heck of a motivator. Which is pretty much everything you could want in a teacher ever. I had the same experience with my guide up on the mountain. So much patience. So much kindness. Such great people there to help you as you do such a fun thing. Before we left on our journey, I knew there were two major disadvantages I’d have to deal with as I skied the Rockies. I’m from the East. While I can confidently ski almost all of the slopes and trails at home, they’re inherently easier than what you find out West. I’m a pretty determined person. When things are hard, it makes me even more motivated to conquer the task. So even though I knew I had some things working against me, I was confident I’d be all right. I should have thought something was off when I had to get boots two sizes larger than normal. I didn’t, though, and we hopped in the gondola, watching the dramatic wonders of the Northern Rockies out the window. By the time we got up to the top of the mountain, I was thinking I should have gotten a size bigger. By the time we started our first run (which was freaking gorgeous by the way–both in scenery and in snow quality,) I was in an incredible amount of pain. It turns out my biggest enemy that day was one I hadn’t accounted for, and one I couldn’t defeat through sheer determination. It was the altitude. It made my feet swell like crazy. I sat down for a minute, thinking that by taking some pressure off of them the swelling would magically go down. As I was sitting there, I started to get a little bit dizzy. I wish I were able to insert an, “And yet she persisted,” meme at this point. But I can’t. As much as I wanted to push on, it became clear that it would have been a very bad idea. I reluctantly gave it up. Apparently I’m not the only person this happens to. 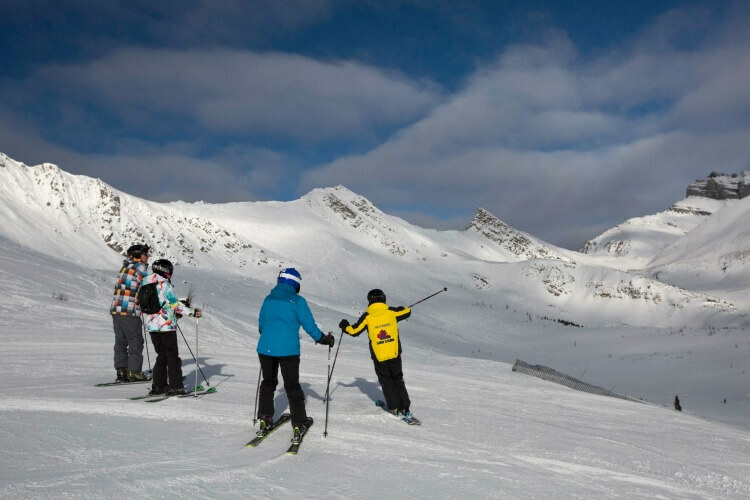 When people come in from lower altitudes, many of them will stay in the mountain town of Banff for a couple of days prior to hitting the slopes. It gives your body some time to adjust. Newbie mistake on my part. Not all was lost, though. 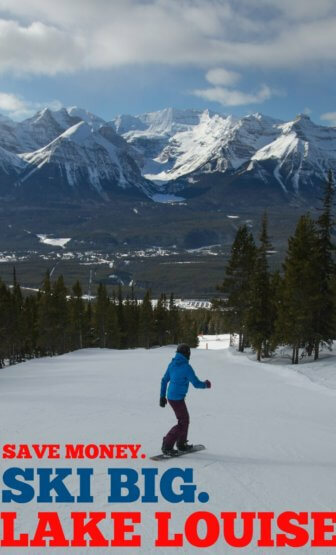 Thankfully, there are tons of entertainment options at Lake Louise. The resort is incredibly family friendly. They have kids’ skiing lessons, a daycare and a tube park. The latter is what we tried out with the remaining part of our day. Tubing is a lot like sledding only they have an amazing course built for speed complete with some friction mats at the end to slow you down and keep everyone safe. I can just show you, though. This video will be best viewed through VR goggles. If you don’t have them, you can use the mouse on your PC or your finger on your phone to change your POV. If you are viewing through goggles, look up to see straight in front of you. This is my first action 360 video–promise I’ll get the orientation right for you guys next time. When you get to the bottom of the course, if you look to the right you’ll be able to see one of the lodges. There are two that host dining options with a total of six restaurants. They have everything from ready-made burgers and fries to a sushi bar so you can eat according to your tastes–or budget. There’s so much to do that we couldn’t do it all in one day. On top of skiing and tubing, you can take a snowshoe tour through some pretty remote places to some breath-taking vistas. On our way in, we also checked out the wooded entrance to the trail leading to Skoki Lodge. It’s a backcountry lodge, which is admittedly something I had never heard of before. We saw people headed into the wilderness on their cross-country skis to the luxe cabin in the woods. They had a journey of about seven miles to a location picked for it’s idyllic views. In the summer, I learned, you can hike it. Literally removed from civilization, Skoki Lodge is a hidden B&B that includes three square meals for its up to twenty-two guests. It looks gorgeous and is a priority the next time we go back. For sure. The sheer value of Lake Louise in and of itself is overwhelming. Add to that the awe-inspiring views and it becomes a must-see for every skiier, snowboarder or person who wants to try snowshoeing. They’re open through May, so you still have lots of time this season. Like I said, I’m going back. Mainly for the reasons I just stated. On top of that, though, I’m not about to let a mountain defeat me. This entry was posted in travel, Ways to Save Money on December 13, 2017 by femmefrugality. Sorry the altitude got you, but it sounds like a wonderful trip anyway. Have fun when you go back, and don’t let that mountain get the best of you! It was and I won’t! Thanks, Gary! Like you I had no idea that would happen! So sorry but it sounds like you had fun anyway. Listen you would have persisted but you were smart enough not too! Have a great Saturday! Thanks, Vicki. I had experienced the thinner air before thanks to altitude, but never the swelling and dizziness. We know for next time! Looks like amazing views and a great way to connect with nature. That’s interesting about the altitude’s affect on one’s body. I didn’t know that. Oh man, Lake Louise is beautiful. That altitude though, what a bummer! Good thing there was plenty more to do. I hope you get to go back soon! It is, isn’t it? I hear (and have done a ton of image searches confirming) that it’s to die for gorgeous in the summer, too. And, amen… so much to do! Altitude can be a b**** but I’m glad you still had a great time, sounds like it would be fun! Haha thanks, Liz. And it really was. I’ve never been skiing, but that’s good to know in case I ever get up the nerve. 😉 Hey, I need some more adventure in my life. It’s awkward the first time you get on skis, but after that it’s a freedom like I’ve never experienced before. 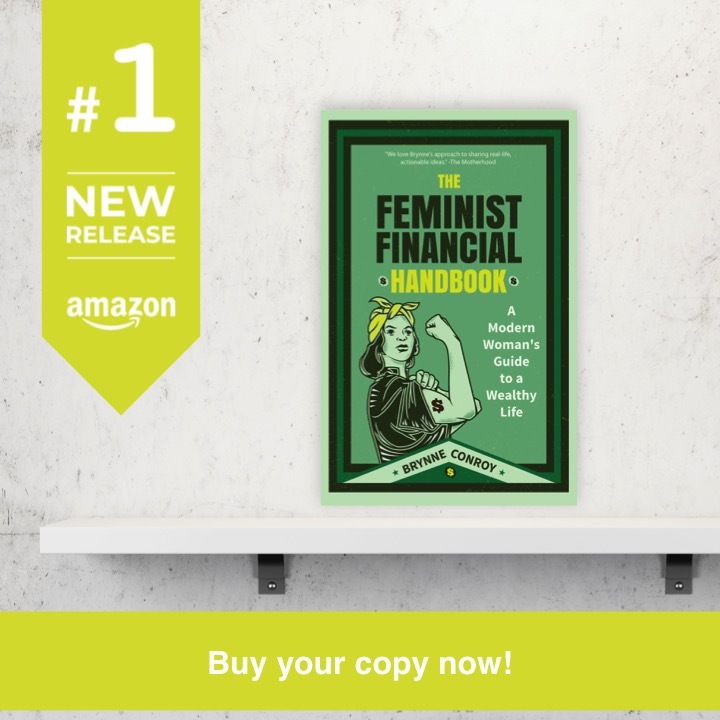 Highly recommend the first article linked to in this post if you’ve never been! I usually think skiing in the West is kind of easier than skiing in the East. The conditions here aren’t usually that good and I know in NJ, you pretty much learn how to ski on ice. Also, as a skier, I’m way happier when I’m working my way down the mountain than when I’m trying to stand, waiting in line (stupid ski boots). I love going out West. And agreed. Ski boots are made for skiing, definitely not standing or walking! Hope you get to have more fun next time. Seems like a great family friendly resort. Pictures are beautiful! Thanks for sharing. It seems to be pretty cost effective too. Thanks, Michael! We did have fun–we were super lucky they have so much to do! We were just up there and happened upon the World Cup racers while walking around Lake Louise. While we didn’t get to ski, we did stop by to see the resort and it was grand. Such a beautiful area and well worth the trip. Like one of the info desk peep said there, American’s can essentially get a 20% discount when traveling to Canada. Nice! Glad you enjoyed it, too! And that’s a great point about the 20% discount–and so true!